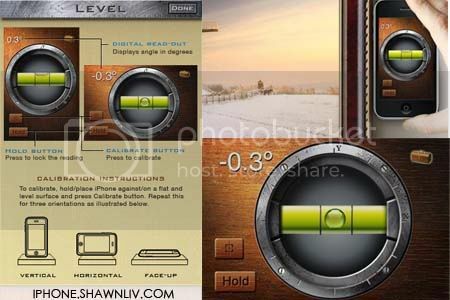 iHandy Level (one of the 5 tools in iHandy Carpenter toolkit) is now for free! Take this chance to download! This might be the most beautiful and accurate level you can get in hand. Unlike some other levels in app store, this one is fully functional with calibration capability. It’s accurate after calibrated. Because the sensor inside every individual iPhone/iPod touch could be built slightly differently, to make the level more accurate for your device, you need to calibrate before use. 1. Find a flat surface. 2. Hold your device upright (in portrait mode and home button at the bottom), put the bottom edge of the device on the flat surface, then press Calibrate button (the one with a target image on it) to calibrate the portrait mode. 3. Turn your device 90 degree clockwise (now it should be in landscape mode and home button on the left hand side), again keep it upright, and put the current bottom edge (long edge) on the flat surface, then press Calibrate button to calibrate the landscape mode.